Guesting at the Rose City Comic Con Sept 7-9! Along with the fun people listed at the bottom of this blog, I'm a gaming guest at the upcoming Rose City Comic Con in Portland, Oregon. I lived in Portland for years during and after college, so it's going to be great to see old friends as well as new people. Friday the 7th at 3 p.m. in Room 8, Paul Peterson and Tim Eisner and I are on a panel called Ask a Game Designer. Despite the ongoing example of the Onion, I'm pretty sure we won't be dispensing relationship advice. Friday at 6 p.m., and again on Saturday at 5 p.m., I'll be at the Rainy Day Games booth signing things, talking about games, and running a demo or two for a couple hours. 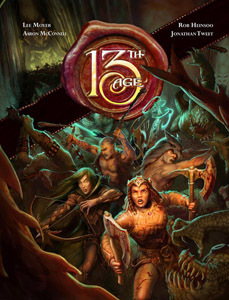 The last time I was at Rose City Comic Con I ended up running a 7+ player demo of 13th Age for people who had never played rpgs before and who immediately turned the game into the only fully Player vs. Player deathmatch I've ever GMed! Speaking of deathmatches, this show I'll be demoing the Wrestlenomicon card game that I designed along with Shane Ivey and Dennis Detwiller for Arc Dream Publishing, coming to Kickstarter soon. Here’s the plan: we’re going to create a series of three 13th Age books that contain fully playable short adventures for all 13 of the icons, one adventure per icon at each of the three tiers. Oh. Wait. We already did it! The three books of mini-adventures are called High Magic & Low Cunning, The Crown Commands, and Fire & Faith. They’re designed by Cal Moore, with me handling development. It turns out we made a mistake calling the series of books “Battle Scenes.” Yes, there are battles in these adventures. Most adventures focus on a series of potential conflicts. 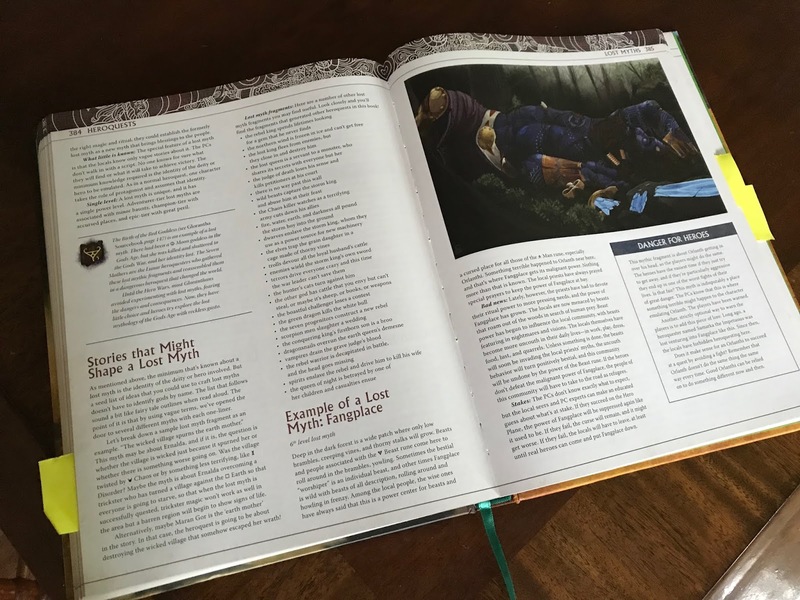 But there are also suggestions for other paths, reskinning advice to help you fit each adventure into your campaign, and all the types of icon-related details you expect in a published 13th Age adventure. Cat and Simon and others who spend time behind Pelgrane booths at conventions noticed the problem first. GMs who are interested in buying books of mini-adventures sometimes skip right past the three Battle Scenes books because they want more for their game than battle scenes. Hooray for GMs who want to tell worthwhile stories! Boo for us choosing the wrong name. If you haven’t tried these mini-adventures in your game, the whole bundle is described in more detail and available here. Jonathan Tweet gifts my blog with gaming-centered posts, and here he is, finally looking at something we created together! At Gen Con, I finally got a copy of 13th Age Glorantha for myself, and when I got home I looked it over page by page. During production, Rob worked with the art and layout to bring the book together, but I kept my eyes off it so I would be able to see the final book with fresh eyes. It was worth the wait! Over the last forty years, various art styles have represented Glorantha to gamers, and 13th Age Glorantha touches on all those styles. From Cults of Terror (1981), there’s a classic, full-color, black-and-white illustration of Thanatar. He’s the severed-head god whose worshipers steal magic from the heads of those they decapitate. There are plenty of stylized images of gods and heroes, which are perfectly suited for a myth-oriented world like Glorantha. Some illustrations are drawn in a comic-book style, which suggests the archetypal quality of the myths and those involved in them. Some illustrations represent a more recent style of Gloranthan imagery, with details inspired by East Asian and South Asian cultures and religious art. Other illustrations are gritty fantasy pieces, reflecting the down-to-earth aspects of roleplaying in Glorantha. It’s fun to see all these styles together, and it’s a cogent reminder that your Glorantha is up to you. The Glorantha Sourcebook is a treat to look at, too. 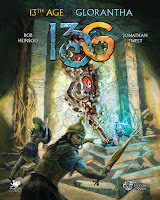 It’s a system-free companion to 13th Age Glorantha, and it has lots of art that I would have loved to see when I was running Glorantha campaigns in high school and college. The iconic images of the gods do a great job of connecting the abstract background of Glorantha’s divine beings to the everyday life of characters in the world. Here’s a photo of a meaningful illustration from 13th Age Glorantha. This section of the book is about a terrible part of the God Time where your god was defeated, and this is Rich Longmore's depiction of the mighty Orlanth, defeated and broken. The player-characters get to enter the God Time in their god’s place, and then it’s their turn to face the denizens of Fangplace. You can see I’m bookmarking some pages. These are places where I wrote something particularly harsh. Chaos is on the rise, and there’s plenty of harshness to go around. In one scenario in particular, I almost feel sorry for the players. This is a guest post on from Jonathan Tweet, who is in the last 24 hours of his Over the Edge Kickstarter with Atlas Games. I didn't directly contribute to the design of Over the Edge, but it turns out that I contributed indirectly! Rob’s first professional appearance at Wizards of the Coast was when he in brought an interesting skirmish miniatures game and showed it to leads in the game design group as a possible acquisition. It was designed as a Glorantha game, but it would work the same way for a Magic-based miniatures game. The special dice you rolled mostly had numbers on them, but some faces instead had runes that triggered special abilities. When you rolled the dice in this game, the numbers you rolled were important, but so were the runes. He brought the same approach to 13th Age, where a monster’s attack roll determines not only if it hits but also whether something else happens. For example, if a phase spider hits you with a d20 roll that’s even, it can make a second attack to steal one of your magic items. The attack roll means more than simply hitting or missing, and the gamemaster can use the same attack over and over with different results from round to round. The original Over the Edge from 1992 had a linear dice mechanic, where your roll of multiple dice resulted in a number that indicated how well you had performed the task being attempted. The new Over the Edge has a linear scale on two dice to determine success or failure, and it adds good twists (if a die is a 4) and bad twists (if a die is a 3). These are the surprising results, good or bad, that are part of the conflict’s resolution. The good twist and bad twist rule was the original concept that the whole dice rolling system is based on. That approach derives directly from Rob’s dice systems that provided results that were different not just in quantity or degree but in quality. The Kickstarter for the new Over the Edge ends Tuesday, August 14, at 11 am Pacific. Our Wednesday night gaming group stepped away from 13th Age games for about a year to play many short campaigns of Jonathan’s new Over the Edge. We had fun with the initial draft, but I don’t think the first mechanics entirely worked for the group. A WMD-user named Ann Thunder was our nemesis in that campaign. We were all supposedly savvy agents but the storyline was eventually titled Ann Thunder Escapes. Ann Thunder had our number. Our second long campaign went much better, though the mechanics were still in flux. We’d made jokes about our PCs running a sandwich shop together, and when the player who loved that joke wasn’t at the table the night we created characters, we gave him his wish! We called our shop Bread, Beef, & Beyond. The ‘beyond’ included a bomb-maker whose bombs changed people for the better and a transhumanist geneticist. Now that I think of it, the plot also hinged on the moment a ritually-augmented cow took an accidental plunge off the top of a university building, so there was more beef involved than I’d realized. The next long campaign is where the mechanics came together wonderfully. We (well, maybe that’s largely me) stopped getting knocked out of roleplaying rhythm to question the mechanics. The roleplaying took off. This final version of OTE faultlessly handled our four diverse PCs going off in different directions, having full arc-closing experiences, and looping back together in a central plot. I’m hoping we return to this campaign some day, we were either going to get thoroughly messed up by the Temple of Divine Experience or just maybe we could come out on top. Or both! The Kickstarter runs another four days. 13th Age Adventure Design Seminar. 11 a.m. to noon. . .
We run these as audience-participation workshops, so y’all will brainstorm a 13th Age adventure with Jonathan Tweet and Wade Rockett and I functioning as multiclass ringleader/muses! I’m likely to be around the Pelgrane booth other hours also, but if you want to be sure to catch me, these are the times. I’ll be running games of Wrestlenomicon in the First Exposure Playtest Room. It’s a two or three-player card game of apocalyptic professional wrestling between elder gods, launching on Kickstarter later in August!! My co-designers Shane Ivey & Dennis Detwiller of Arc Dream will be running Wrestlenomicon in First Exposure starting at noon. The later shift goes to Fire Opal Games CEO Marie Poole and me, Marie will start at 4:00 while I’m in the Pelgrane booth. 13th Age Monster Design Seminar. Another audience participation workshop with experienced 13th Age monster designers at the mics . . . and one developer, if Paul Fanning can join us. Two of the monsters created in previous seminars appeared in Lions & Tigers & Owlbears: 13th Age Bestiary 2 last year! Here’s something you won’t see every year: at least three game designers involved with different games, all inspired by the same world, getting together to compare perspectives and approaches. Of course it’s Greg Stafford’s world of Glorantha, and Jeff Richard and Jason Durall and I will be talking about HeroQuest, RuneQuest, and 13th Age Glorantha. Jonathan Tweet, Michael O’Brien (MOB) and I will take a jaunt through the many Gloranthas that helped create our 466-page labor of love and talk about the many possible campaigns it can help create, in and out of Glorantha. I put this demo and its pregen characters together last week. 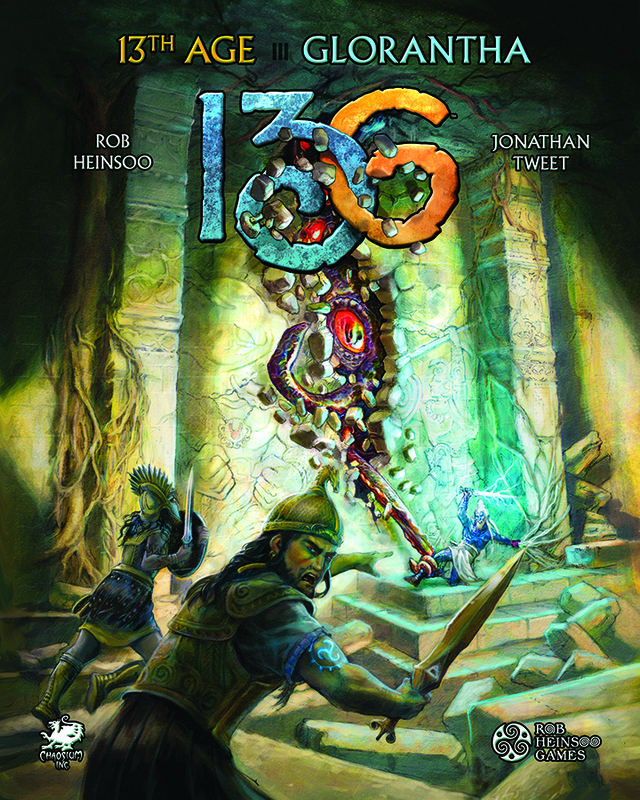 It’s in the freeform style you may have experienced playing the 13th Age convention demo I created a few years back. Other GMs will be running the demo throughout the convention. …And that’s the plan, aside from business meetings, design meetings, seeing friends, keeping contact with Fire Opal Games comrade Jay Schneider as he helps run Dragonfire and Shadowrun: Crossfire events, and touring the hall to surf the wave of thousands of happy gamers!